We were excited to produce this booklet, designed and illustrated in-house at Target by Aaron Melander. 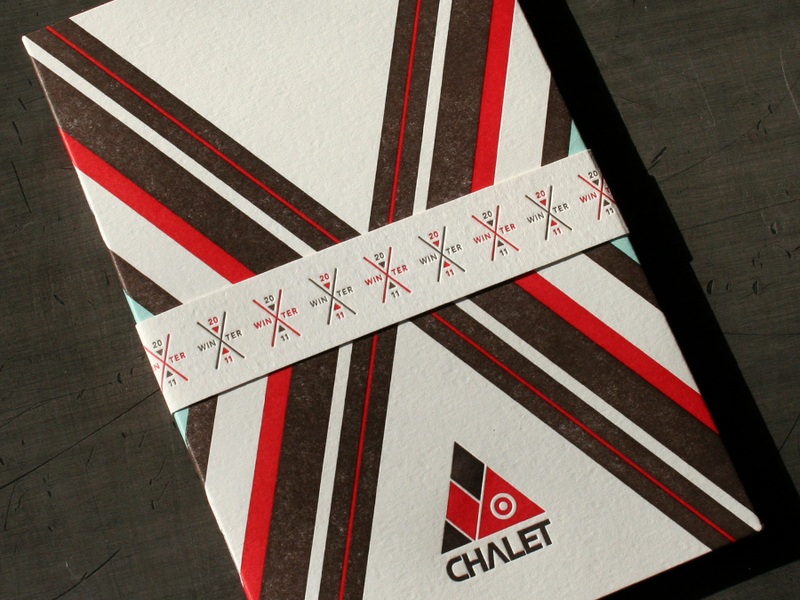 This piece was created for guests of the Target Chalet as a field guide to the 2011 Winter X Games. To begin the project, we worked closely on the paper selection. It needed to be thick and sturdy in feel yet thin enough to do some 180 degree folds to form the inside cover pocket. For the cover we duplexed two stocks after printing - off white on the outside and brown on the inside. The outside is 78lbC Canaletto Granna Grossa printed in tight register three color letterpress. A tonal pattern printed on French Poptone Hot Fudge 80lbC floods the inside. One of our favorite commercial shops in town then helped with the interior printing and bindery. The gutt was traditional 4 color offset printed and saddle stitched at Shapco. Since the open edges of the cover are folded to the interior a final trim with the gutt in place was not possible. That meant the gutt pages needed to be stitched separately, trimmed to size, then stitched again into the cover.